These adorable dragon finger puppets are a salute to Toothless and Light Fury from How to Train Your Dragon. Cut out template on card stock, pin it to the felt and cut out. Once the body has been cut form a loop with the two strips between the arms and legs of the body piece. Secure with hot glue. Next cut out the eyes using fun foam; green eyes for Toothless and blue eyes for light fury. Draw in pupils for eyes with a black marker. Then attach the eyes with glue. The final step is to fold the wings like an accordion and attach them with hot glue in the center of the dragon's back. Take your dragons for a test flight! 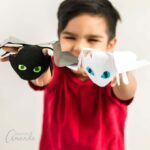 This project for Dragon Finger Puppets was printed from CraftsbyAmanda.com - https://craftsbyamanda.com/dragon-finger-puppets/ and can only be printed for education or personal use.